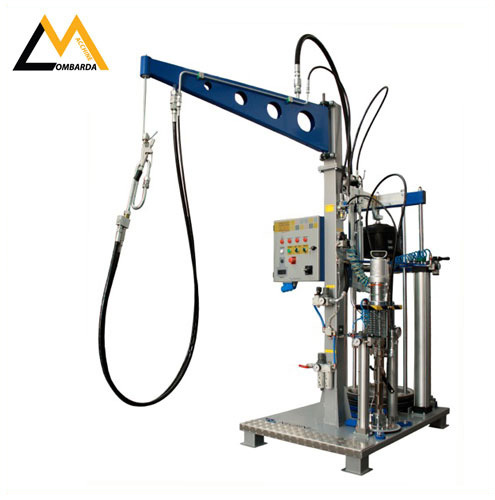 Monocomponent pneumatic extruder for Silicone o Polyurethane, from 25Lt. to 200Lt. Extrusion capacity from 60 to 500cc per cycle (according to the type); driven lift, supply air engine, supply air lift. Teflon pipe 3000 mm and mechanical gun. Extrusion capacity 1500 cc/min. (25 C.), adjustable mixing ratio from 7% to 12% in volume, air pressure feeding from 2 to 7 Bar. Components: base component pneumatic pump, catalyst dosing pump, pneumatic pump for the catalyst, mixing unit with Alpha-plast. Min. and Max. pressure alarm for the components, empty drum signal for the base component and for the catalyst, alarm maximum stopping time, manual washing or electrical pneumatic washing, sampling device to check the mixing ratio. 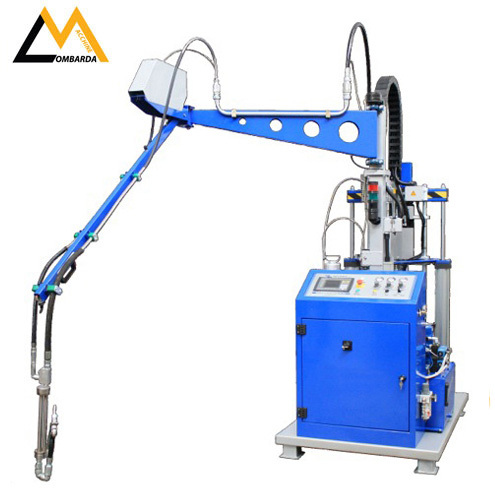 Optional: washing pump, heated thermostated plate for base component, heated hoses of base component, pneumatic balance banner for mixing group, mechanical balance banner for mixing group, roller for ease of drum change, mixer Alpha-metal. Extrusion capacity 1600 to 2800/3200 cc/min. (25 C.), adjustable mixing ratio from 7% to 12% in volume, standard voltage 380V tri-phase+neutral, air pressure feeding from 2 to 7 Bar. Components: base component hydraulic pump, catalyst dosing pump, pneumatic pump for the catalyst, mixing unit with Alpha-metal, min. and Max. pressure alarm for the component, empty drum signal for the base component and for the catalyst, alarm maximum stopping time, manual washing or electrical pneumatic washing, sampling device to check the mixing ratio, heated thermostated plate for base component. Optional: washing pump, heated hoses of base component, pneumatic balance banner for mixing group, mechanical balance banner for mixing group, mixer Alpha-metal R07 1009/15. Adjustment and digital display of the working temperature from 160° c up to 200° c. Adjustment of the extrusion capacity from zero up to 0,7 kg/min by means of a safety valve. Die cast aluminum construction tank. Bronze-made pump for higher resistance to overpressure. All resistances are stainless steel-made and are not directly in contact with the material to be extruded. Automatic locking of the pump in case of anomalies in the heating plant. Double control of the heating system to avoid start-up below working temperature. Protection against over-pressure of the exit hose by means of the capacity adjustment safety valve. Safety protections against access to the dangerous parts of the machine according to the European norms. Thermic protection of the motor, of the resistance and of the low voltage circuit. Control circuits which are in contact with the operator are in security low voltage 24 Vac. Heating gun is in security low voltage 48 Vac.